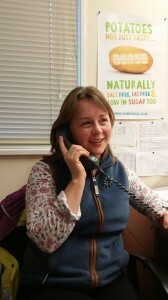 Miriam Doe began her career in the potato industry as a temporary seed potato growing crop inspector for the Scottish Government based in the Angus area while on summer holidays from University. Following graduation, she started full time employment at Greenvale AP in 2006 as a fieldsperson and in 2010 she became Seed QC Manager. In February 2015 Miriam moved to WCF Horticulture as seed buyer, purchasing approximately 3000 tonnes for the horticultural market. When she is not working Miriam enjoys curling for Dunsinane Curling Club and training her horse with a view to entering competitions next year. Miriam is Committee member of the Royal Highland Education Trust – a charity which promotes food and farming to school children. She is currently working on a new potato growing project for schools within Perth and Kinross. This entry was posted in Members Area by Charlie Greenslade. Bookmark the permalink.